What’s happening in Ferguson, Missouri right now is being called the end of the post-racial era, hopefully, the beginning of a new mass movement, but at the same time it has such disturbing echoes of the past that it feels like we haven’t gotten anywhere at all with this issue. Mike Brown, an unarmed black man was shot to death after being approached because he was walking in the street, a witness said his hands were raised and yet he was mowed down and it would never have happened this way in the safer precincts of the white, American dream. The events in Ferguson have been extraordinary in the sense that there is a spontaneity and passion in the nightly protests that reflect–despite the apparent, scattered presence of outside agitators–a unique community spirit. The marchers all understand what the problem, is, and how they have have felt like they’ve been living under conditions of disenfranchisement and authoritarian repression. Several stories have appeared describing the effects of how the subtle shifting of demographics, as well as attack on voting rights, have pushed poor communities of color out of urban areas and into suburbs run by whites in government and in the police force. Other factors, like the increasing militarization of police–something that seems new to some in the media, but has been casually referred to in Hollywood films as far back as the ominous helicopter surveillance of South Central LA in movies like Boyz N the Hood. The systematic dismantling of popular protest through the use of semi-military crowd control strategies like kettling have plagued dissenters as far back as the 2000 Democratic Convention in Los Angeles and have been used to quickly dissipate protests against the War in Iraq, the Republican Convention in New York in 2004, and of course, Occupy Wall Street. At this point I had minimized the stream’s window into a corner so I could catch up on some work, when suddenly, the ambient crowd noise, which had been minimalist till that point, began to sound panicked. At about the 13:25-minute mark of “Tensions Rise in Ferguson” you begin to hear shouts in the crowd about police throwing tear gas off in the distance. Cars begin to make U-turns and honk. Then, at 16 minutes, the host’s voiceover acknowledges the rumor and begins telling his driver to move the vehicle he is in closer to the scene of the crime. By 23:30, the transition is complete. The Argus radio vehicle is approaching the police, and for the next several minutes the viewer is assaulted with high-pitch crowd control sounds and a relentless barrage of tear gas canister explosions. It is apparently at this point that a reporter is threatened by the police. Pool got to the action a little late this night, understandable since Vice has been trying to cover most of the 12 a.m.-5 a.m. curfew, and had a hard time finding answers, dodging more bullets on the way. 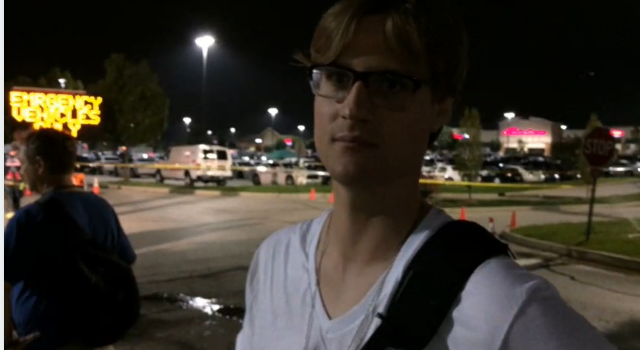 But he really comes up with a scoop when he finally makes it to the Target parking lot staging area the combined police forces had been using and begins talking to a news photographer he identifies as “Marcus.” (You can watch this post here: http://new.livestream.com/timcast/events/3295551/videos/59723806) As he tells it, Marcus had been at the very front of the demo, just across from the combined police forces, and claimed, with absolute certainty, at the 10:40 mark, that “The police said something about a Molotov being thrown–I was there in the front with another photographer–there was absolutely no Molotov thrown at all. Not even a little bit.” At 18:50, he reiterates the claim, saying that he had “video rolling literally the entire time from when the cops pulled up to when they started firing tear gas–not a single Molotov cocktail was thrown.” Other reporters, while maintaining skepticism, agreed that all their interviews with protestors claimed the same thing, no provocation. So, when you go to the press conference that was finally held about 45 minutes after Tim and “Marcus”‘s conversation, you see Captain Ronald S. Johnson, a seemingly sincere man but reduced to the role of “good cop” amidst the second-rate SWAT wannabe spasmic violence meted out by local authorities, saying that “multiple Molotov cocktails were thrown at police,” causing them to respond with tear gas. The other situations described by Johnson, such as the McDonald’s break-in (which some have described as an attempt to get liquids to treat tear-gas victims) and shots fired at police, all seem to have occurred after the initial police gas attack. While there is some speculation here, there is a remarkable lack of witnesses–besides the police themselves–who have come forward to back their side of the story. It has been a staple so long in conflicts between police and community members and demonstrators, to accuse citizens of being the aggressors when it simply isn’t true. It’s a strategy that was even used in Mike Brown’s case–he was accused of possibly robbing a convenience store (the video is inconclusive) and was said to have grabbed for the officer’s gun, supposedly warranting the shooting. Inevitably, the autopsy reports have shown that he was shot at least six times, and that there were no signs of struggle. Tonight, the National Guard comes in and the curfew is lifted. It’s unclear whether anything will get better. One thing that should be immediately investigated is whether the tear gas that’s being used is banned in some parts of the US. When I covered the abuse of Puerto Rico police (the second largest police force in the US) during labor and student demonstrations in 2010 and 2011, it was revealed that the CN gas that was used was so toxic it was banned by many mainland police departments. And there are so many issues that have to be resolved to even begin thinking about seriously moving forward. The officer in question must be indicted. The militarization of police departments must be addressed. The no-tolerance “broken-windows” policy that seems to govern most police thinking when they confront young people of color must be critiqued and possibly invalidated. True civilian review boards and police oversight committees must be created. And this country must ask itself why it cannot seriously confront the history and legacy of race discrimination. Why bringing it up causes so many to deny it with hostility. Why it seems normal that we live in hyper-segregated communities, and how wealth inequality is a massive part of the equation. There are so many questions. 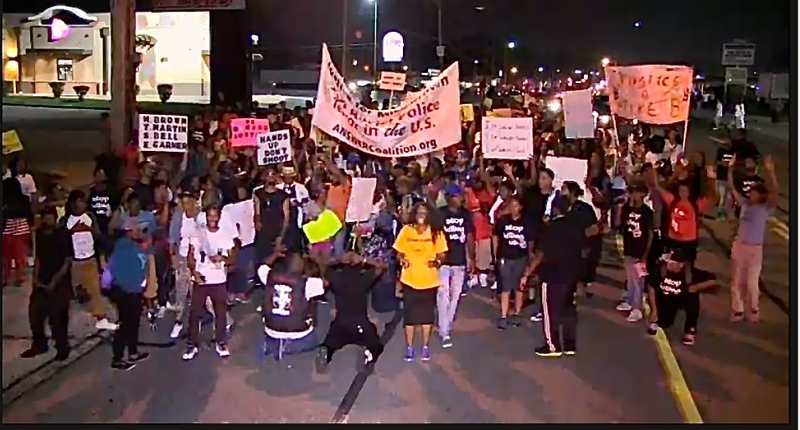 Too many to be solved by one summer night in Ferguson, Missouri. wish I knew how to share your commentary on facebook.